The agreement was signed in November 2007. Wyndham pursuits to become the Ukraine’s market leader in 3* hotels segment. The franchising model is widely used by Wyndham Hotel outside the US market. 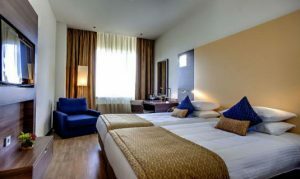 Ramada hotels were introduced in Russia last year with a plan of ten hotels opening in the Moscow residential areas. Ukrainian horeca market is growing rapidly to meet the increasing inflow of foreign tourists and especially to cope with the peak year of 2012 when European soccer championship finals are expected to take place in the Ukrainian capital city of Kiev. No visas are required for US and EU citizens to visit Ukraine which makes it a much easier touristic venue than Russia.